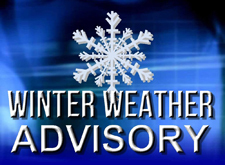 The National Weather Service in Peachtree City, Ga., issued a winter weather advisory, which includes the City of Avondale Estates and the rest of metro Atlanta from 3 p.m. this afternoon, Friday, January 22, to 9 p.m. tomorrow, Saturday, January 23. What is a Winter Weather Advisory? A winter weather advisory is when a low-pressure system produces a combination of winter weather (snow, freezing rain, or sleet) that presents a hazard but does not meet the warning criteria. What can you do to stay safe and prepared after a winter weather advisory has been issued? - Have extra medications or special items for babies, disabled and the elderly. - To report a power outage, call Georgia Power at 888-891-0938 or report the outage and view an outage map online here. - Charge cell phones and other mobile devices. - Have extra batteries for flashlights and radios (to prevent fires, do not use candles). - Obtain rock salt or environmentally safe products to melt ice on walkways; along with sand to improve traction. - Make sure you have snow shovels and snow removal equipment. - Check for a sufficient amount of heating fuel. In the unlikely event you become isolated in your home, and regular fuel sources may be cut off it is recommended that you have a good supply of dry, seasoned wood for your fireplace or wood-burning stove. - Adequate clothing and blankets to keep you warm. - Minimize travel. If travel is necessary, keep a disaster supplies kit in your vehicle. - Bring pets/companion animals inside during winter weather advisories. - If you will be going away during cold weather, leave the heat on in your home, set to a temperature no lower than 55 degrees Fahrenheit. How to drive in the snow and on icy roads. Know you winter weather terms. Family emergency supply kit must-haves. Do you know what to do if you encounter black ice? 7 Tips to keep your pets safe during winter weather. - Be aware of and keep an eye on neighbors, especially the elderly. - Share this information with other people. You can do so by posting this notice in a public place of distributing copies by hand or mail. - Call 9-1-1 for emergencies. The Avondale Estates Public Works and Avondale Estates Police Department are on standby. The National Weather Service in Peachtree City, Ga., issued a wind advisory, which includes the City of Avondale Estates, and the rest of metro Atlanta from now until 6 p.m. tonight, Friday, January 22. What is a Wind Advisory? A wind advisory means that there are expected sustained wind speeds of 20 mph or gusts up to 35 mph or stronger. Winds this strong can make driving difficult, please exercise caution.